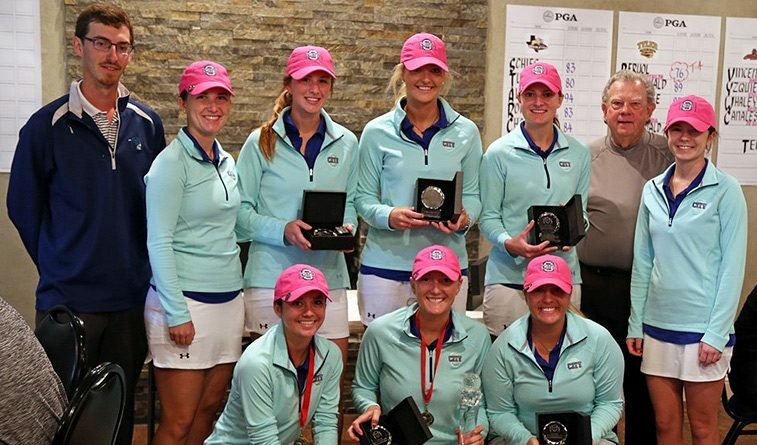 VICTORIA, Texas – Heavy rain swept through south Texas on Sunday night, rendering the final rounds of the Houston-Victoria Claud Jacobs Invitational unplayable, clinching the win for the Oklahoma City University women’s golf team. Oklahoma City, ranked second in the NAIA, won its second straight tournament of the season with a first-round score of 313. The Stars won the Claud Jacobs Invitational for the fourth time in the five years. Emma Allen took home first place individually thanks to her even-par 72. Allen, a junior from Broken Arrow, Okla., finished two strokes clear of teammate Anna Mikish to win the tournament playing unattached. Allen secured her first career win as a Star. “I’m really proud of every single one of our girls for staying positive and fighting through tough conditions,” OCU coach Marty McCauley said. Mikish, a senior from Choctaw, Okla., finished in a tie for second place with a round of 74. She led the team in par-5 scoring at 3-under. Raegan Barnes provided OCU with a first-round 77 and finished in a tie for sixth place. Barnes, senior from Choctaw, Okla., hit a tournament-high 13 pars in her 18 holes. Kailey Campbell shot an 80 to finish tied with teammate Melissa Eldredge, who played unattached, for 10th place. Campbell, a senior from Okatha, Okla., led the field with five birdies in the tournament. Also competing for the Stars were Savannah Moody (82), Regan McQuaid(82) and Katie Lee-Wilson (84 playing unattached). Moody and McQuaid both tied for 15th in the tournament. OCU will compete again March 6-7 in the Bucknell Battle at Boulder Creek at the Boulder Creek Golf Club in Boulder City, Nev.